Its time had now come. It abandoned Gollum. But then something happened that the Ring did not intend. It was picked up by the most unlikely creature imaginable. A hobbit, Bilbo Baggins, of the Shire. In The Hobbit: An Unexpected Journey movie, Bilbo and a goblin fall after they fight. Bilbo wakes up under the mushrooms, the goblin is unconscious. Bilbo sees Gollum. He tries to drag the goblin to his own place for eating. The goblin struggles and Gollum starts to hit it until it dies. In this fight, the One Ring falls from Gollum's pocket. Gollum starts to drag the now unconscious goblin. Bilbo waits until he leaves, he stands up, picks his sword under the mushrooms and then see the Ring. He takes it and puts it in his pocket. The Book: Bilbo awakens in total darkness; it's so dark he literally cannot tell the difference between having his eyes open or closed. He gropes around on all fours, and his hand accidentally brushes against a small ring of cold metal. He puts it in his pocket without thinking and continues on his way. He sits down for a moment. He feels for his pipe, then for his tobacco, but cannot find a match. That's the last straw for Bilbo Baggins' hopes, and he despairs for a moment. He draws his sword, and noticing that it "shone pale and dim before his eyes," found enough hope to continue. Using his sword as a source of light, he trots along. Also there is a video from youtube which explain my question. In my opinion, these three stories are quite different. I don't expect they all should be exact the same but I didn't expect they will be quite different. Is there any reason makes this situation different each other in films and movies? I don't think those three stories are particularly different. They all share the same core: Bilbo gets lost in the caves beneath the Misty Mountains, where he finds the Ring, after it was dropped by Gollum (or, more precisely, where it dropped itself away from Gollum). 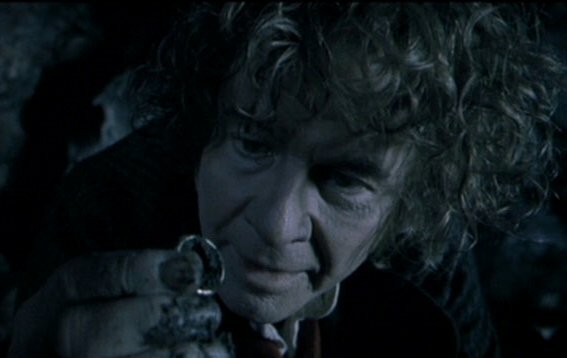 This is the essence - the ring wanted to leave Gollum and be picked up by someone else to take it away, and it was. The rest is incidental - does it really matter if Bilbo groped around in the dark and found it, or saw it on the ground and found it? Does it matter if we saw the Ring fall from Gollum's pocket or only seen the end result of it? Not really. The essence remains the same. As for the reasons for the differences - groping around blindly in the dark can make for a good narrative in a book, but is quite boring to see on screen. It's not surprising that Peter Jackson decided to liven it up with some action. And as for the bit in The Lord Of The Rings - well, it's merely an overview, not a detailed scene. Bilbo found it. End of story. Bilbo gets separated from the Dwarves. He finds the Ring in the tunnels. Some time previously Gollum had lost the Ring. You can attempt to rationalize this by saying that all stories get embellished as they are told and retold, and in fact Tolkien's Silmarillion stories often display a similar trait, with multiple conflicting versions of the same event. To address the three versions, the story told in the Fellowship of the Rings movie is obviously just a summary; we don't need to know (or are expected to already know) specific details, all we need to know here is that "Bilbo found the Ring". so it happened that Bilbo was lost for a while in the black orc-mines deep under the mountains, and there, as he groped in vain in the dark, he put his hand on a ring, lying on the floor of a tunnel. He put it in his pocket. It seemed then like mere luck. In An Unexpected Journey one of the major changes is that the scene doesn't take place in total darkness. It should be obvious why this change was made; you can't show a 5 or 10 minute scene of nothing but total darkness to a movie-going audience. Only a few hours ago he had worn it, and caught a small goblin-imp. How it squeaked! He still had a bone or two left to gnaw, but he wanted something softer. How did we lose it, my precious? Yes, that's it. When we came this way last, when we twisted that nassty young squeaker. That's it. Curse it! It slipped from us, after all these ages and ages! The effect of the movie change is therefore to show this event to audiences, rather than have it as something that we instead learn about as something that happened in the past. Having it a goblin that falls down after Bilbo links it to the main storyline rather than have it be a completely separate event (that may confuse audiences). So - not so different, after all. I think the reason the 3 stories are a bit different is because of the mediums that the are being told. In a book an authour can get away with indroducing the reader to a pitch black enviromennt, because the reader is looking at the pages of a book and their imagination is doing the rest. However on the film its not that simple. In the Fellowship introductory scene, I think Jackson stayed pretty true to the book. Obviously he couldn't show Bilbo in a pitch black environment as that would confuse audience members who where unaware with the books. Although Bilbo literally stumbled upon the ring. I liked that. Although in The Hobbit: DOS, I think Jackson wanted to add some drama. Thats why he had Bilbo and the Goblin fall. Also it gave him a chance to show how cruel and emotionless Gollum was (Bludgeoning a goblin with a rock). And also desperate he was and how little he had (Eating the previously mentioned goblin). This, in my opinion added another bond between Gollum and The Ring. Making the audience understand a little more how much Gollum was losing when Bilbo took the ring. And the mushrooms where just to look pretty and provide natural lighting for the scene. In the novel, he had been in the goblin-made tunnels of the Misty Mountains after being captured along with all of the dwarves. Gandalf had come and rescued them as always, and Dori had been carrying Bilbo on his back while running because Bilbo couldn't keep up. A goblin had grabbed Dori's legs, causing him to fall, flinging Bilbo off his back and knocking him out. When Bilbo woke up, he felt around on the floor and found the ring, and without hesitation put it in his pocket. He did not know its powers until later when he put it on. The scenario in The Hobbit: An Unexpected Journey is quite different, because the scene in the book was in a setting of absolute darkness and it would have been extremely difficult to direct it that way. Not the answer you're looking for? Browse other questions tagged the-lord-of-the-rings tolkiens-legendarium the-hobbit the-fellowship-of-the-ring an-unexpected-journey or ask your own question. Why did Remy (the rat from Ratatouille) cook Ratatouille at the end of the movie? How fast does information about the presence of orcs/goblins reach “Sting”?